Create a colorblocked look in your bedroom with the Adel Collection. This geometric chevron design uses light grey, taupey grey and aqua for a unique update to this pattern. Two decorative pillows features teal as well to pull this whole look together. Pink has never looked so fabulous. This set has bright and bold collection of pink/white polka-dots on a black background. If you’re looking for bedding that spells “contemporary”, they’ll love the circular shapes and ribbons that indulge this collection. 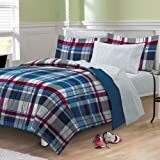 Make a statement in your bedroom or dorm room with this bold Varsity Plaid complete bedroom ensemble! The ultra soft comforter and sham features a classic plaid motif in multi-colors of denim blue, burgundy, gray and white; comforter and sham reverse to a solid denim blue. A coordinating sheet set showcases an allover geometric print and is constructed of 100% polyester microfiber fabric. CAVOY COMFORTER SET – 5 PIECE Lend a touch of understated luxury to your bedroom with this welcoming bedding set from Comfort Spaces. The Cavoy comforter set features a tufted pattern on the center which gives this bedding set texture and dimension. Cover your beds in this comfortable bedding set for an elegant feel and look. Spruce up your mood with this pleasant set from Comfort Spaces that comes with a bed skirt, comforter, 2 shams and a decorative pillow. 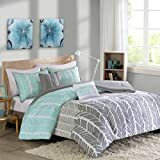 This comforter set is available in both Queen and King size as well as other color options such as Blush, Navy, Red, Ivory, Taupe, Grey and Aqua. SERVICE If you don’t absolutely love this product, return it within 30 days for a full refund. We’ll work with you to resolve any issue and ensure that you’re satisfied with your experience.